A Blog dedicated to bringing back those wonderful memories of childhood by bringing you videos of all of the great programmes we loved as children! 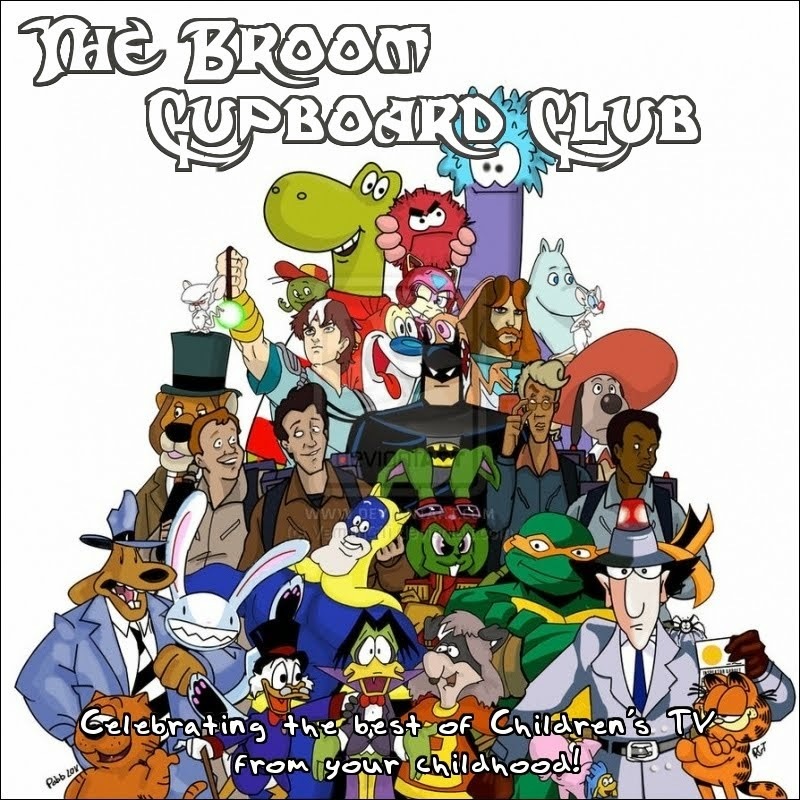 The blog is named after the 'famous' Broom Cupboard that many of the shows were broadcast from. Let the reminiscing commence! Hi everyone! After a quiet couple of months on the blog, I've found this absolute gem which I would have loved to have posted back when I did a little Look and Read season a while back but I couldn't find it online, but it's here now and not a moment too soon! I give you Geordie Racer! The story was set in Newcastle-upon-Tyne and the surrounding area, and featured pigeon racers and runners competing in the Great North Run. The main character is Spuggy Hilton (Spuggy being a nickname - the Geordie word for sparrow), who isn't a runner like the rest of his family, but is a keen pigeon fancier and owns 'Blue Flash' - one of the best birds in Newcastle. He and his friend Janie observe some suspicious activity, and link a spate of local art robberies with obscure messages they find on some of the pigeons, but find they have even more problems when they go to spy on the crooks. It's been a while since I posted anything new to the site, unfortunately it's getting harder to find shows to share, but this time I've got a show I've been searching for for over a year now, it's the classic Filmation cartoon Sport Billy! The story revolves around a young boy named Sport Billy who is from the planet Olympus (a twin of Earth on the opposite side of the Sun) which is populated by athletic god-like beings. Billy himself has a magic size-changing gym bag - the Omni-Sack - which produces various tools as he needs them. He travels to Earth on a mission to promote teamwork and sportsmanship. Described by the show's theme song as a "hero from another planet", Billy battles the evil Queen Vanda and her gnome-like henchman, Snipe. Vanda's mission is to destroy all sports in the galaxy since fairness disgusts her. Billy is assisted by two faithful companions, a girl named Lilly and a talking dog named Willy. The trio travel around in a time traveling spaceship, which resembles a giant wind-up clock, complete with a ringing bell, and mounted on two rocket engines. Each episode the trio travel through time to save a different Earth sport from Queen Vanda's grasp. Today we honour a great fantasy writer who sadly passed away earlier today with the animated adaptation of one of his novels, with Terry Pratchett's Discworld - Soul Music! Spinning the tale of Spider-Man in a completely different direction late in 1999 came this short lived series featuring Spidey in situations never before encountered in Spider-Man Unlimited! While covering the launch of John Jameson's one-man mission to Counter-Earth (another Earth located on the far side of the Sun), Spider-Man attempts to stop his two symbiote adversaries Venom and Carnage from boarding the shuttlecraft. Blamed for Jameson losing contact with our Earth, Spider-Man becomes a target of persecution by the media and the public. Believed to be dead after saving a person's life in a fire, Peter Parker uses the ruse to embark on a mission to retrieve John Jameson on Counter-Earth, using nanotechnology stolen from Reed Richards to design a new suit that incorporates stealth technology and sonic weaponry. Making his way to the planet, Spider-Man learns that Jameson has fallen in with a band of freedom fighters opposed to the High Evolutionary whose Beastials, hybrids of animal and humanoid attributes, are the dominant species whilst humans are the second-class minority. With Jameson reluctant to return until all of the Beastials are defeated, Spider-Man elects to remain on Counter-Earth, blending in as best as he can as Peter Parker, and fighting the High Evolutionary and his Knights of Wundagore alongside the rebels as Spider-Man. It is soon discovered that Venom and Carnage are also on Counter-Earth, and are following orders from the Synoptic, a hive-minded legion of Counter-Earth symbiotes. This series also shows the animated version of John Jameson's Man-Wolf form, as well as superhero versions of mainstream villains the Green Goblin and the Vulture. Time Travel. Who hasn't wanted to go back in time and change a few things around? That's what happens when a young scientist and her motorcycle time machine get going in Time Riders! Doctor BB Miller, a young scientist, is working on time travel. She succeeds in bringing a young boy, Ben, to the present from the 19th Century, but then her time machine explodes. Once repaired, BB and Ben are transported to the English Civil War, and are captured by Roundheads. Then they are captured by Cavaliers, and the sinister Lady Chalmerston decides to 'play' with them. Eventually they manage to effect an escape and eventually return to the present. All videos are copyright of their respective owners. I own no rights to any of these shows. Awesome Inc. theme. Powered by Blogger.